"Are you ready?" THE MASCOT is open! "Dooley Lives!" Pictured: Matt Rich, Jake Gillespie, R.H Wilhoit, Emma Carter, Sam Cordes. WE'RE OPEN! And the reviews are coming in! This last month has been a truly magnificent experience. My heart is so full from spending me time surrounded by such talented, experienced, professional artists. 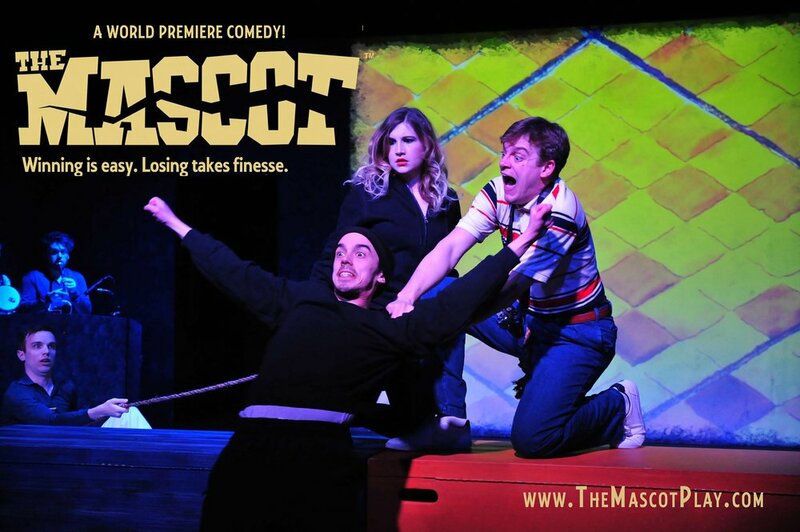 Rehearsals for The Mascot were both challenging and gratifying. New works can be tricky, especially when they've never been performed on their feet before! But we found our footing, we found our characters, and we created a world together: playwright, director, actors, and designers. I am so thankful I've had this opportunity. Everyone involved has been nothing but generous, kind, and supportive. Our director, Peter Zazzali has brilliantly orchestrated the wackiness of this world. Our playwright/producer Jerry Hickey is an absolute sweetheart, and he's been wonderful enough to give us some creative freedom with ad libs or line adjustments. I can't express how amazing that is. I've gained a whole new level of appreciation for both actors and playwrights when it comes to producing new work, something I hope to carry over into future productions. I'm lucky enough to be playing the diabolical Dia. She's dramatic, she's dynamic, and she's a TOTAL badass. You may find her practicing monologues in her gothic-nun get-up or breaking into the boy's dormitory like the ninja that she is. She uses her sexuality to manipulate the story's protagonist, Knute, into eliminating her arch-nemisis Dooley, but ends up falling in love with Knute before shows end. It's a nice little arc and a ride I enjoy taking night after night. So if you're near KC, join us for a night of mascot mayhem! We run Thursdays-Sunday until April 29th. Get in the game!